Donald lived in the house next door to Kath Potter-Irwin, where his son and family now live. Donald was a roadman in the 1960s and 70s looking after a twenty mile stretch of road. Working travellers, doing dry stone dyking, ditching and copping, often joined him. The Duke of Argyll was apparently encouraging of travellers journeying through his lands and working there. Through meeting these travellers, Donald learned how to make the ‘hen’ frame basket. 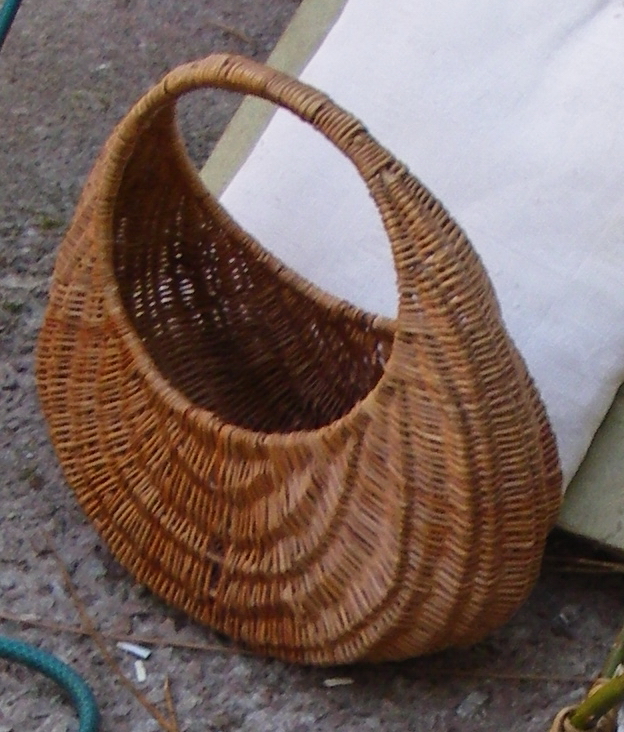 Apparently this basket also became known as the ‘Brigitte Bardot’ basket because the French actor was renowned and photographed carrying one. So the basket became fashionable. He apparently harvested all his willow himself from the road edge, which he would have been coppicing anyway. He also planted quite a bit of willow that he liked to work with to increase his supply. He used to tie bits of wool to ‘his’ willows so that passing travellers would know not to take it. He stripped all of his willow by buffing it in a cooking pot. Donald was very secretive about his basket making and would not teach or even let anyone watch him at work. 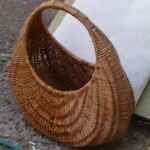 He was a keen contributor to the local agricultural shows but always seems to have entered the same type of basket, with variations on the handle wrapping. He made his hoops by fitting rods on to a piece of plywood with nails on it.